Have you ever seen something and thought “really? !” Imagine my surprise when I went to work at GCC in Oregon and I was given the staff sweatshirt. I asked one of my (non-D) co-workers about it, how I don’t agree, and she told me that the director came up with it. It was meant in a way to mean “well then it must be awesome.” I didn’t go around all of a sudden agreeing with it, but I kinda kept my mouth shut as well. When I was a counselor at CCF, someone started saying “The best things in life have a broken pancreas.” For a D camp slogan, I think that’s pretty awesome. During one of the weeks, a young, ped endo was our camp doc, and as we were walking to the fields she asked me if I agreed with the sweatshirts/t-shirts, “because that’s the exact opposite of what I tell my patients.” I don’t remember what my specific response was, but I know that in that instant I was grateful for her question. 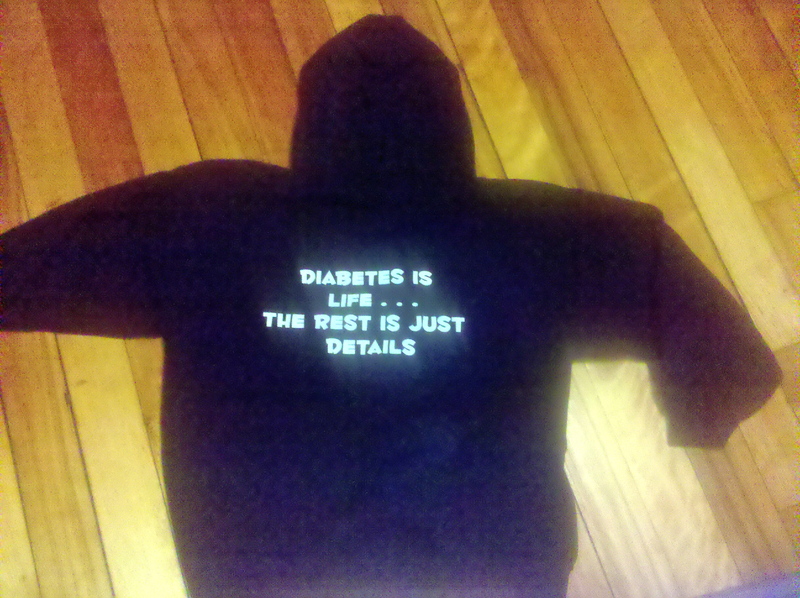 And for re-affirming my belief that diabetes is not everything. LIFE IS EVERYTHING. Family is a piece. Friends are a piece. Running is a piece. Work is a piece. Tennis is a piece. Skiing is a piece. Laughing is a piece. Swimming is a piece. Reading is piece. Diabetes is a piece. Painting is a piece. Traveling is a piece. All these pieces are pieces of my life. I bet the pieces of your life might be different, but they’re your life, they should be different. And I hope that for every one of you out there reading this, diabetes is only a piece! …Now what to do with this sweatshirt? I love this! And do what I do keep it in the far corner of you closet maybe the moths will chew up the letters until it says diabetes is just details. Love you Broccoli! I’m somewhat torn on this, because I could easily go both ways on it… 1.) On one hand, it’s a regular part of life and is just that – life. It is what it is and it’s just normal, but pretty much is our life. It may even “define” it, in terms of providing purpose and happiness and advocacy and influence our decision-making. 2.) However, that doesn’t mean it dictates and controls our life. I think diabetes can be our life, but on our own terms. That’s the key, in my eyes. Hmmm. Ok. That’s it. I think it makes sense… but I could be totally off.